In relaying information about donations TDHS received in 2015, related information came to light about the "Truckee River Route." Appropriate credit is rendered to each source. We also provide a list of research materials we consulted for the article. ​(Above) Letterhead for the San Francisco to Reno Highway Association, Truckee, California. 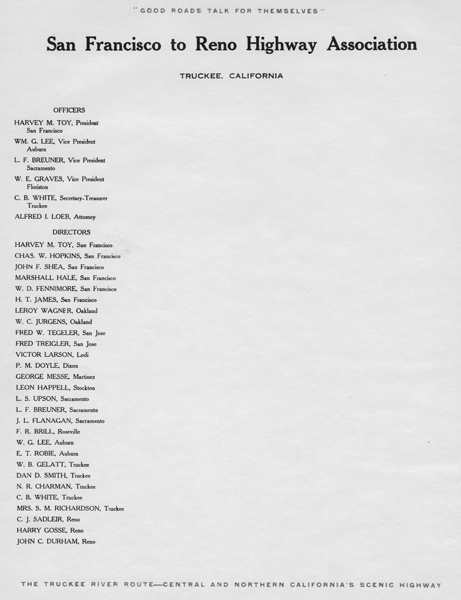 Note President Harvey M. Toy, of San Francisco, and C.B. White and W.B. Gelatt, Truckee. Note corresponding envelope to the right addressed to Mr. White, postmarked Dec. 9, 1921. (Top) Nevada County Civilian Defense Council card, sample; (middle), Dec. 9, 1921 postmarked letter to Chamber of Commerce, Truckee, that complemented the San Francisco to Reno Highway Association letterhead (left); (bottom left) The S.F. 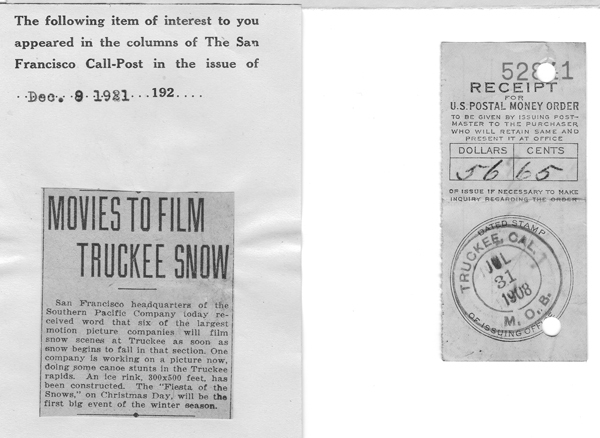 Call-Post newspaper snippet dated Dec. 9, 1921 about movies being filmed in Truckee; and (bottom right) a July 31, 1908 U.S. Postal Money Order receipt. Sample Civil Defense Card, 1942. References for the article ON WINGS OF TERROR include the following newspaper accounts dated March 20, 1946 or thereafter. And for the B-29 crash, newspaper references dated March 20, 1946 or thereafter.